Hybrid MMA gloves are a great alternative to traditional MMA gloves because of the extra protection it provides. 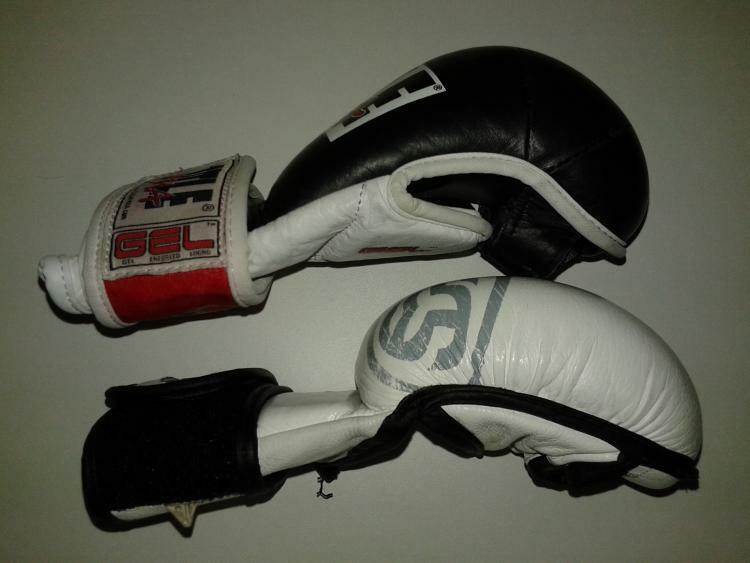 Furthermore, these types of gloves allow the individual to to practice hitting focus mitts and heavy bags as well as use it for sparring. In my search for spare gloves to carry around and add to my current collection, I looked into the Reevo brand after being satisfied with their RXR boxing gloves. 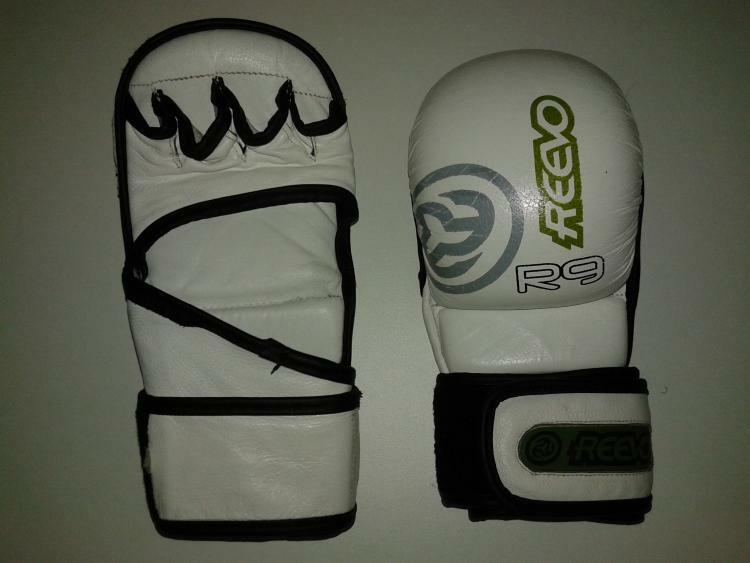 The content in this article examines my experience with the Reevo R9 Gauntlet hybrid MMA gloves. Leather Construction - Reevo R9’s outer shell and wrist straps are made with premium leather. Color Options - The R9 gloves are only available in two different colors, which are black and white. Pre-curved Padding - In addition to the R9’s thick padding for your knuckles, its padding also comes pre-curved. 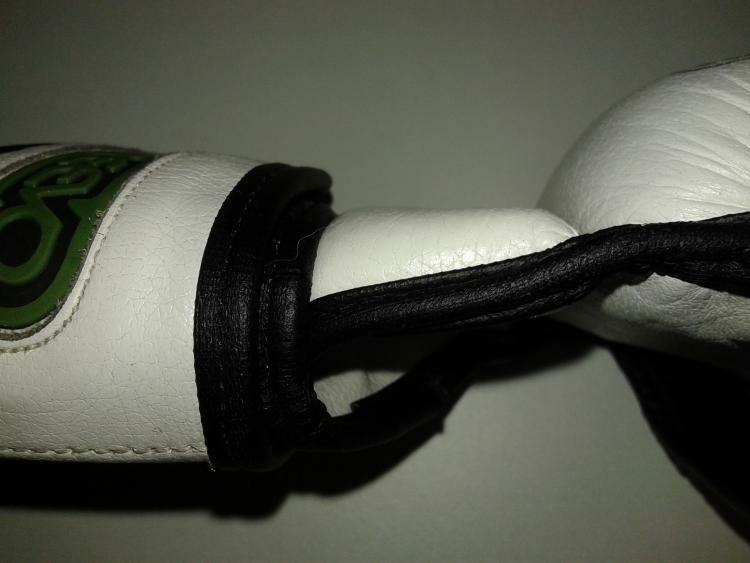 The following image shows the curvature of the R9 compared to the Title GEL hybrid MMA glove. The R9 padding is not as curved as the Title option, but it is curved enough that it does not flex your fingers outwards. Open Palm Design - Having an open palm design allows for maximum breathability for your hands and you can have more feel during the grappling portion of MMA. Finger Grips - The design of the R9 has its finger grips portion be comprised of a soft leather material with reinforced edges. Additionally, this section is extended so it covers the upper edge of your palm as well. No Thumb Protection - For grappling, the R9 having no attachments to the thumb is great because you do not feel the resistance or hindrance it might cause during sparring. However, the tradeoff is not having any padding to cushion your thumb from impact. Padded Wrist Bar - Unlike MMA gloves that have a single continuous padding covering the back of your hand and wrist, Reevo R9 has a separate piece of firm foam to solely protect the back of your wrist. In addition to the extra protection, this design gives the glove better flexibility and comfort in forming a fist. Wrist Strap - The length of the R9 wrist wrap is devised to be long enough to wrap around the user’s wrist twice. This allows you to tighten the wrist straps to your liking and securely lock the glove to your wrist. The soft leather feels great on your hand and does not scratch your teammate’s skin. The R9 is on the lighter side of hybrid style MMA gloves, which is terrific because it mimics the weight of traditional MMA gloves. Crucial hand grips, such as the s-grip and gable grip, feels more comfortable to obtain with the R9 than my Title MMA gloves. However, it still does not feel as natural as other traditional MMA gloves I have put on. The R9 did not require me to break it in much before comfortably using them. I enjoyed the comfort felt from the reinforced edges of the R9’s finger grips and how it does not uncomfortably dig into your fingers like the Title MMA gloves. The combination of having no thumb attachment, soft finger grips and well-designed seam flex points grants me the ability to have responsive control with the R9 and makes forming a fist easier. This configuration is great for more grappling based MMA practitioners. I noticed a couple of flaws in the R9 construction that separates it from the high quality and more expensive options available. The first one is the cutoff intersection seam between the glove and the wrist strap. This segment is not covered off the like Title MMA glove. The wrist strap’s reinforced edge and where the lengthy piece of black leather overlays its starting point looks quite sloppy. Furthermore, this part for one of the gloves is definitely becoming undone over time. Overall, my R9 is holding up pretty well. 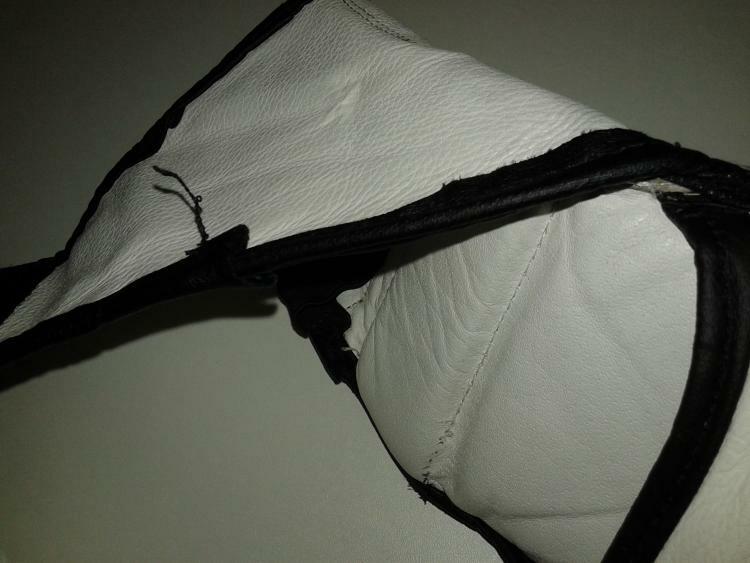 The only exception is the tear that is forming by the seam connecting the wrist strap to the glove. 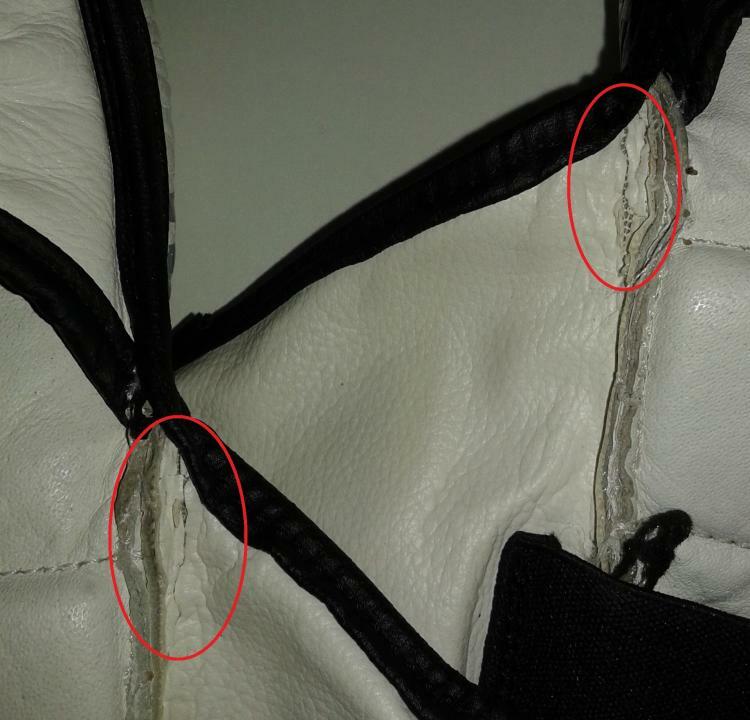 The subsequent image shows this tear, circled in red, occurring on both of my R9 gloves. Other than that, some minor threads are starting to unravel, but it currently has no effect on the comfortableness or effectiveness of using the R9. The velcro stickiness is working fine still. One major problem I have with the R9 is how the wrist wraps is actually shorter than it should be. Even putting the gloves on someone with a small wrist, the second hook and loop region does not match up entirely. This faulty design has cause my wrist straps to accidentally come loose during striking and grappling exchanges. Furthermore, the exposed region will cause avoidable abrasions to your teammates. 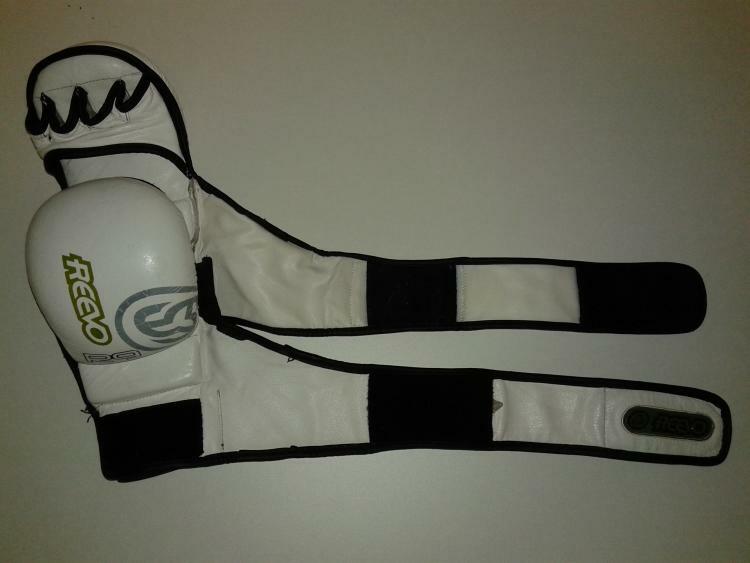 Therefore, R9’s short wrist wraps may become problematic and annoying, especially if you wear hand wraps with it. The image below display this shortness problem. 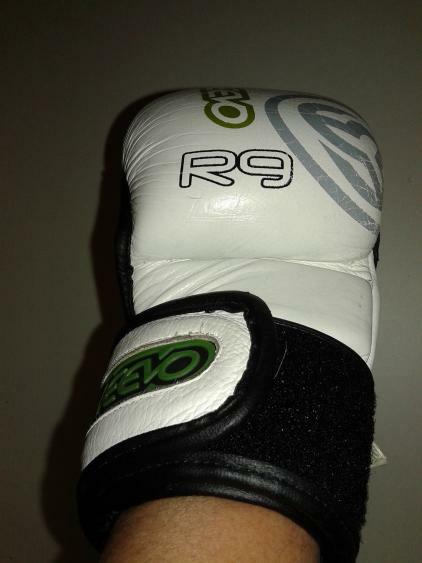 The Reevo R9 utilizes a medium density foam that has a comparable firmness to my Reevo RXR boxing gloves. 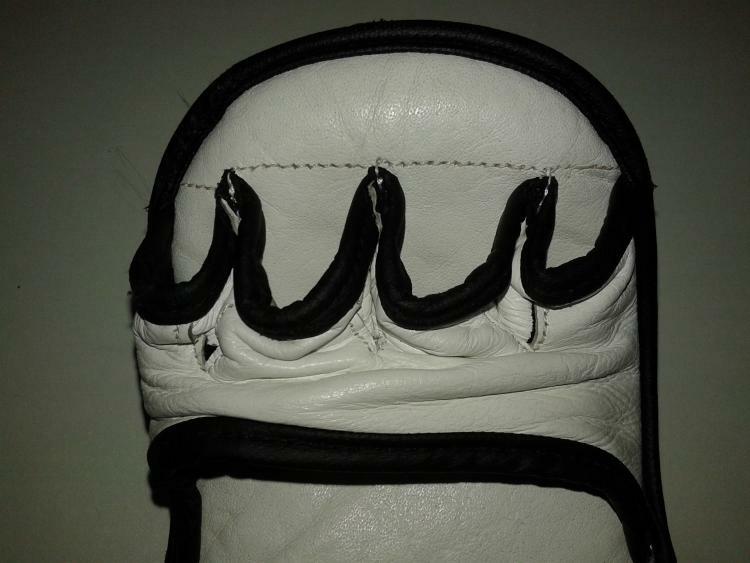 Even though it has a nice thick padding, it does not have the thickest padding in the hybrid MMA gloves market. Of course, the trade-off is that the R9 is lighter and it feels closer to using a traditional MMA gloves than the Title option. R9’s extra padding is absolutely awesome for longer sparring sessions. Moreover, it allows me to bring up the intensity without worrying too much about damaging my hands and training partner as I would with the traditional MMA gloves. At the price of $35, t﻿he R9 is one of the more inexpensive options for hybrid MMA﻿ gloves. I personally consider this a great price for it. The R9 is a good pair of gloves that I would recommend to those just starting out their MMA adventure.